sure if you found legendary weapon. or just make it +11 ~ +12. It is hard, but if you have the credits and willing to take the risk, it is worth it. Still not sure which weapon I want to aim for anyways. 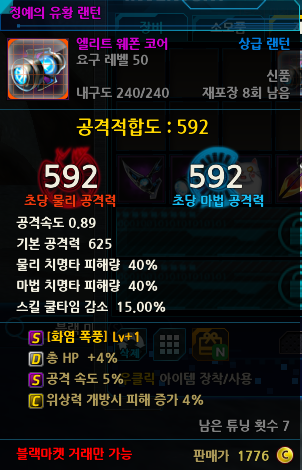 lv 53 whip is good but not the best elite whip. The best one is gotten through boxes which is lv 50. It depends on play style, if you wants to have great CD, choose the CD type weapon which I have posted (that legend lv 45) or the lv 53 witch stick or lv 50 elite lamp with bonus. 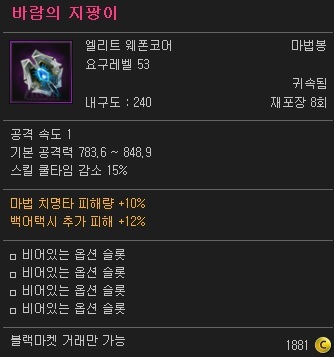 Seulbi is able to get high dps with CD due to the lv 37 amulet. Bascially the play style will be every enemy spawn, gather with black hole, FM then move on to next spawn. No need to wait for the skill to slowly recharge again. Although CD is great, atk spd is also very important. Slow atk spd isn't always a bad idea, remember the times where you need to stay airbone and could not stay long enough due to skill animation is too fast. Slow atk spd will make your skill animation slower, meaning you will stay airbone longer. Ofcourse the skill damage to boss will be slower too. P.S To SeaDa: Good luck with the upgrade, it is really hard. Apparently google translate it into wind wand. Not sure whether is it the best wand but it is easily obtainable and quite popular for CD build. With Area 5 special dungeon release, I guess better equips are coming though.